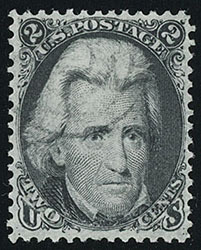 1863, 2¢ black, light target cancel, rich color and crisp impression, choice centering, Extremely Fine and attractive; with 1992 P.S.E. certificate. A link back to Sale 81 - Lot 752, along with its description, will be appended to your message.